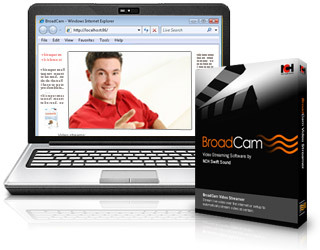 BroadCam allows you to stream videos from your PC. To record streaming videos, webcams, computer screens, and other devices, try Debut Video Capture Software. To watch BroadCam video streams, viewers need either a web browser with the Flash plugin installed or Windows Media Player. Record video through your webcam using Debut Video Recording Software. Convert pre-recorded video files to different formats with Prism Video File Converter. Edit your pre-recorded video files with VideoPad Video Editor to create movies.